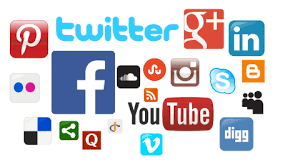 Social media platforms are set for a major windfall this election year as media experts believe advertising spends on social media will see a jump of around 150% compared with the previous general election year of 2014. This is as per a report by the Economic Times. Some advertisers expect social media alone to corner about Rs 12,000 crore in ad spends this year with Facebook taking a lion’s share of that. “Facebook will continue to lead,” said Sandeep Goyal, founder of Mumbai-based communications agency Mogae Media. “With a new leader in India and an organisational rejig, Facebook will be even more potent and penetrative. Twitter will also gain traction, but advertising dollars may still stay shy of Tweepledom. The medium is still to grow beyond being newsy.” He expects Facebook alone to pocket Rs 10,000 crore ad money with the rest of social media getting about Rs 2,000 crore. In 2018, the overall digital advertising market size was estimated to be around Rs 10,819 crore by Dentsu and it is expected to reach Rs 24,920 crore till 2021 by the company. “We are estimating a 100-150% growth in ad spends on social media for this year’s general elections compared to 2014 which is very substantial,” said Ashish Bhasin, CEO, South Asia, at Dentsu Aegis Network. “All the political parties have seen the benefits of social media and a lot of issues are fought on social media platforms like Twitter. 2019 will mark the first general elections where digital and mobile will be an integral part of the strategy of all political parties,” he said. Global digital marketing platform AdLift estimates digital ad spending to reach about Rs 16,800 crore in 2019. Girish Menon, head of media and entertainment at KPMG, said the emphasis on social media as an outreach programme will be much higher this year compared to 2014. “The sheer size of the digital user base has gone up significantly now compared to 2014,” he said. “Whether it is parties or the government, their presence and the time spent by them on social media has gone up significantly,” Menon said. Sam Singh, CEO, South Asia, at GroupM, said elections are one of the key factors that will lead to a growth in ad spends in social media vehicles this year. “Besides these, the other factors that will play a role in its growth are focus on outcomes, new user/customer acquisition in some categories like e-commerce, auto, etc.,” he said. In a response to ET’s queries, YouTube mentioned a blog post published by parent company Google on Tuesday, aimed at bringing more transparency to election ads. 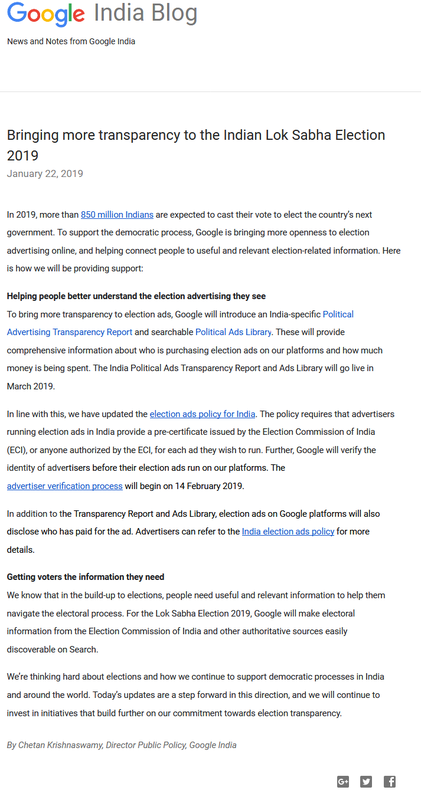 Google said it will introduce an India-specific Political Advertising Transparency Report and a searchable Political Ads Library, which will provide information about who is purchasing election ads on Google platforms and how much money is being spent. The report and the library will go live in March 2019. 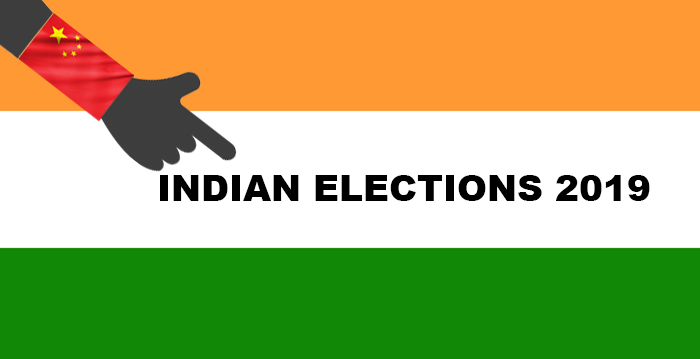 Google said it is also updating its election ads policy for India and the policy requires that advertisers running election ads in India provide a pre-certificate issued by the Election Commission of India (EC) or anyone authorised by EC for each ad they wish to run. Google will verify the identity of advertisers before their election ads run on its platforms and the advertiser verification process will begin on February 14. Agencies such as iGenero and Vertoz expect spends to go up on programmatic advertising provided by players like Google in the digital space which involve more targeted campaigns using software. “As target audiences are present on multiple platforms, advertisers need techniques that enable them to take an omni-channel approach and facilitate multi-platform targeting.” said Ashish Shah, founder of New York-headquartered programmatic advertising firm Vertoz. “Programmatic advertising is the perfect way to achieve this. It is not trend based. It not only provides similar categorisation options, but also allows targeting with a more extensive reach with more advanced and dedicated segmentation,” he said.